DIY (do it yourself) homeowners who have basic tools and experience can take advantage of the unique qualities of Slide-Lok’s Garage Cabinets and Garage Storage systems at a low price. 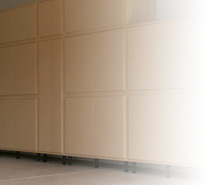 You can easily design and build the perfect garage cabinet or storage solution for any room in your home. Whether you need 2 feet, 20 feet, or more of storage space, Slide-Lok’s stackable, modular design allows you to configure your garage storage the way you want it. We can help you to achieve your garage storage goals. We can assist you in designing your garage storage system, assemble your cabinets, and technical assistance throughout the final installation of your custom garage unit. From our Slide-Lok garage floor coatings that can be installed in a single day to our industry leading Slide-Lok garage storage cabinets and Slat-Wall wall storage, we can get the job done quickly and cost-effectively.